Treat yourself to an afternoon of drawing hands! The hand is arguably the most difficult thing to draw. It takes some practice. But, look, there’s no excuse, it’s always there. Just draw it. Actually drawing your left hand (or your right hand if you’re a lefty) is not that easy, since it’s hard to hold it steady and in a comfortable position. Therefore, I recommend that you draw from photos of hands, which are ubiquitous in our ad-crazed culture. Your desk is full of junk mail showing hands holding a product or pointing to one. It’s not junk mail, it’s a treat. 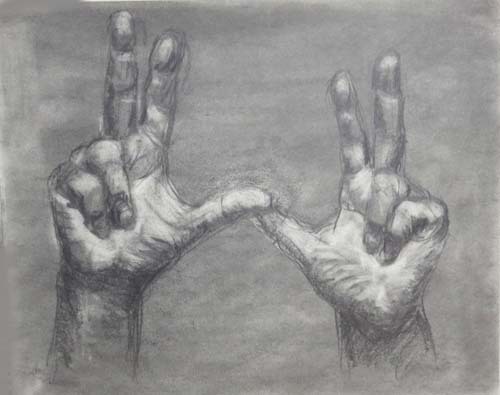 Barbara Heaton in my drawing class worked from a photo of two hands. She drew with a graphite stick on white textured paper that she had previously rubbed gray with graphite powder. The white highlights were created by erasing the graphite down to the original white paper, about 12”x14”. Is this not breathtaking? This is classical drawing. I hope it never gets boring.